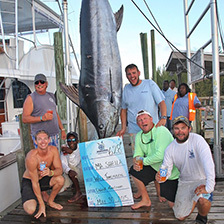 Congratulations to MA SHEILA (formerly the 59-foot Paul Mann CLEAN LIVIN’) for placing second in the third of four legs–the Treasure Cay leg–of the 2015 Bahamas Billfish Championship, with a 628-pound monster blue marlin and another white. Owner Will Tomlinson was the angler. The 68-foot Paul Mann JICHI is second overall in the entire series to date with a win at Guana Cay and a great showing at Treasure Cay. MA SHEILA is eighth overall. Boat Harbour, June 10-13, is the next and final leg in the series. Luis Isalas, owner of JICHI, is in second place for series top angler, and Will Tomlinson is fourth.